Extreme - the best of air mesh seating combined with a full mesh back. 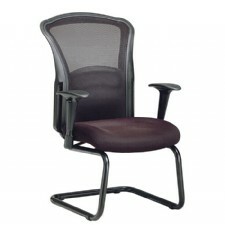 Matching Mesh Back Synchro Task Chair available. Backed by SitWell's Lifetime Warranty on all components and a five year Foam and Fabric Warranty. Weight Capacity ...................... 250 lbs. Please use the fabric search system below to browse available Sitwell Fabrics. Select the Grade you are searching for (i.e. Grade 1). Optionally you can pick Fabric or Vinyl under Style. Then click View Results. You can then click on a fabric to see specifications and different colors. Fabric Color Disclaimer - Due to the inconsistencies of computer monitors and printers, we cannot guarantee colors shown are totally accurate. Please contact Markets West and request actual samples when needed. Please specify pattern and color when ordering samples. Sitwell warrants to the original end user, that components and workmanship be free from defects under normal use *(see below) for the lifetime of the product from the date of purchase. Lifetime : All chair components, which includes, pneumatic seat height cylinder, mechanism, base, casters, arm pads and arm mechanism. Arm pads that are abused such as banging against the worksurface are not covered. Five years : Foam and fabric. *Normal use is defined in this warranty as standard commercial use based upon the product being properly utilized in a typical office environment, 8 hours a day, 5 days a week, with a maximum weight capacity not to exceed 250 lbs. Normal wear and tear is not covered under this warranty. Damages due to misuse, abuse, alterations or negligence are not covered. Sitwell will not be responsible for incidental or consequential damages. No other warranties, expressed or implied are given on products warranted by Sitwell, LLC. Sitwell will repair, replace or provide, at its discrection, without charge to the original purchaser only the defective products or parts as described below freight prepaid to end user or Sitwell Dealer. Labor and service not covered under this warranty. If your Sitwell product or a component fails, please contact customerservice@sitwell.com so that your claim can be expedited.We will e‐mail you a claim form.Please fill out some basic information explaining the failure or defect so that we may properly handle your situation.Please submit a photo as well so that we can identify the chair and component.Production data such as date of manufacture and model # are found under the seat of each Sitwell product.You can also contact us at 1‐866‐SITWELL.